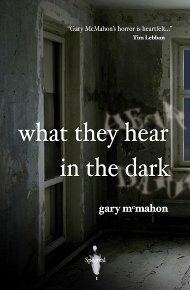 It is with enormous pleasure that I can tell you that Gary McMahon’s Spectral Press chapbook, What They Hear in the Dark, has been recommended for the prestigious Stoker Awards in the Short Fiction category. Bearing in mind that it is only a recommendation and that it has a long way to go yet before it might get put on the ballot, this is still a development I find extremely gratifying, in terms of what I’m trying to achieve with the imprint. It shows me that I’m on the right track with it all, plus that Gary is a great writer. But, if it does go to the ballot stage, however, then even better, and of course I am really hoping it does, as that would be even further validation, so to speak. At any rate, I wish massive amounts of good luck to Gary in the awards! Good luck is also winging its way to two other future Spectral authors. Simon Bestwick, author of the forthcoming Cold Havens Spectral chapbook, has recommendations in the same awards too, for TWO stories, Dermot (which appeared in Black Static #24) and The Moraine (Terror Tales of the Lake District). Alison J. Littlewood, whose The Eyes of Water chapbook appears in June next year, has received a recommendation for her story The Pool, which originally appeared in Shadows & Tall Trees #2. It’s nice to see good authors getting some much-deserved recognition! It has to be observed that the Stoker Awards recommendations list contains some pretty stiff competition, as it does every year, but from Spectral’s perspective this is definitely a step in the right direction and this in its very first year of existence. This will only encourage me to push the quality and strengths of the imprint even further, to ensure that Spectral realises the fullest potential it’s capable of. I shall round this off by saying that, so far, my expectations for how I saw Spectral Press developing have been far exceeded – so let’s see what the next year will bring! !